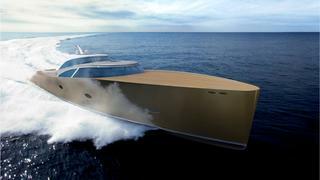 Rapsody Yachts has added the sleek 34.8 metre R110 concept to its line-up. The Dutch yacht builder Rapsody said the R110 has “smooth lines and a sleek profile that will stand out from the crowd”. One of the coolest features of the Rapsody R110 concept is the specially designed garage below the foredeck. It conceals a sports car that can be lifted ashore by an integrated crane. The all aluminium R110 has been designed by Dykstra Naval Architects, the design firm started by J Class yacht designer Gerard Dijkstra. “The R110 is a nice addition to the Rapsody range," commented Diederik van Golen of Rapsody Yachts. "We are renowned for the production of vintage day boats with the right mix of retro looks and modern techniques. This yacht is the epitome of sophistication and class and we are very pleased with the design." The aft deck has plenty of space for relaxing outside, and features a hot tub, two bars and a large sunbathing area. Initial renderings show off this generous space, as well as pointing to steps that lead down to an aft tender garage that has space for a tender and two jet skis. Another set of steps leads up to a flybridge, which offers great views while underway. More views are possible from the interior living space, with 180 degree visibility from the saloon and dining area. This area on the main deck also has a large galley, a day head and a day shower. An owner's cabin and two guest cabins forward on the lower deck provide accommodation for up to six guests. Towards the aft of the yacht there is space for four crew in the dedicated crew area. Twin MTU 16V 2000 M94 main engines give the R110 a top speed of more than 32 knots, although there are various possible engine and propulsion arrangements. 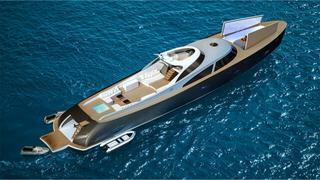 The R110 is a step up from the retro-styled 24 metre gentleman’s yacht concept, the R80, that was revealed in 2014.